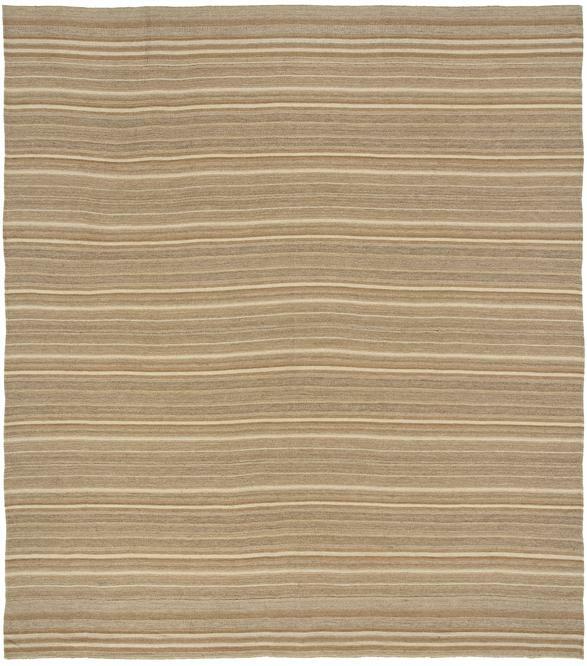 9' 7" x 10' 9"
This outstanding Kurdish Pelas has a design based entirely on horizontal bands or stripes of varying broadness and color. Although restricted to a narrow range of colors, the degree of subtlety and variation within this range is almost infinite. Nor can one readily describe the color of each band or stripe since there is so much internal variegation or ‘abrash’ within each band. The result is therefore quite modern, almost reminiscent of 60’s ‘Op Art,’ where variation in color and form seemed to make designs pulsate with life and energy. It is as if the design here ripples across the surface like waves on a beach.